ITS Education Asia Article - WHAT CAN THE GOVERNMENT DO TO IMPROVE PRIVATE HOUSING AFFORDABILITY FOR HONG KONG CITIZENS? WHAT CAN THE GOVERNMENT DO TO IMPROVE PRIVATE HOUSING AFFORDABILITY FOR HONG KONG CITIZENS? This is the 2nd of two excellent IB Economics Extended Essays that students have allowed ITS to published on our website. Janae was an IB student who sat her exams in May 2016. Janae received a 45/45 overall grade for her IB. This is the extended essay she did on the significant and topical issue of the lack of affordable housing in Hong Kong. This problem was viewed in HK as a contributing factor to the ‘Occupy Central‘ movement of late 2014. This in my view is an excellent economics extended essay on the topic of market failure. I would like to thank Janae personally for allowing ITS to display this EE on our website. 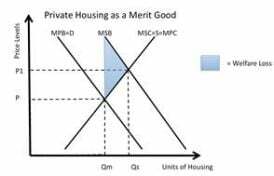 Research Question: Private home ownership is a merit good with a large amount of positive externalities. The lack of affordable housing in Hong Kong is a major social problem, so what can the Government do to improve Private Housing Affordability for Hong Kong Citizens? Secondary research was gathered to demonstrate the types of market failure apparent in the HK housing market and to obtain information concerning the effectiveness of policies that have been used in both HK and elsewhere to deal with the problem. This secondary research was analysed in relation to the primary data collected. The primary research includes interviews with relevant experts and a survey of the HK public to ascertain: a) whether they believe that this is a major social problem b) whether the policies undertaken by the current government are effective, and c) what additional actions can be recommended to reduce the problem. The investigation showed that market failure was indeed present in the HK housing market. Several solutions were also recommended based on the primary and secondary research. The most supported solutions were those aimed at increasing the supply of affordable housing in HK. Recommendations include that the government should build more low cost housing, establish new towns outside the central business area and reduce government regulations and restrictions that increase the cost of developing new affordable housing. There were fewer consensuses on measures to reduce demand. Private housing is a merit good with large amounts of positive externalities, and the consequences of this fall in housing affordability are becoming increasingly obvious. According to a survey conducted by the Children’s Rights Association, housing is the greatest worry of underprivileged children in HK (Ngo, J, 2015). The lack of affordable private housing may be contributing to negative externalities, such as Occupy Central, as young people feel increasingly pessimistic about their future living standards and are dissatisfied with the direction the government is taking (Bush, R.C., 2014, Lee, B.E., 2014, Pau, J., 2014 & Woodhouse, A, 2015.). This can be seen from the following extract. “What can the Government do to improve Private Housing Affordability for Hong Kong Citizens? Primary research will be done through observations, surveys and interviews. Interviews will be conducted with the financial and administration director of the Urban Renewal Authority, Ms Wai, an economist, Mr Hadler (B. Ec., MBA. ), and a professional real estate investor, Mr Cheung. Based on the above primary and secondary research, a stratified survey will be developed and conducted. It will target property owners and non-property owners over 35 or under 25. The purpose of this divide is to see if there are differences in opinions among the older and younger generation. The aim of the survey is to obtain insight on citizens’ views of the lack of affordable housing in HK. The following section outlines the types of market failure apparent in the HK housing market using information obtained from secondary research and interviews. Affordable private housing for middle and low income households can decrease inequality, as in the long run rising housing prices can lead to an increase in asset (Assets are economic resources that can be converted to cash) value, causing “most owner occupiers to become significantly wealthier” (AQA Education, 2011 & Hadler, G. 2015.). Owning private housing is a source of financial security, especially for retirement (Cheung, P., 2015 & Hadler, G., 2015.). On the other hand, people who are unable to buy property are more vulnerable to inflation (Inflation is the increase in general price levels over a period of time) of housing and rental prices (AQA Education, 2011.). The disposable income of households increase after meeting the necessary housing costs, which may lead to the creation of jobs and economic growth (Cohen, R. & Wardrip, K., 2011, p. 2, Hadler, 2015, & Wardrip, K., Williams, L. & Hague, S., 2011, p. 1.). Children that grow in a stable home environment tend to receive better grades (Brennan, M, 2015). Private and public rental housing may become more affordable as demand is reduced, and the waiting time of public rental housing may be shortened (Hadler, G, 2015.). Therefore, the marginal private benefit, which is the additional benefit received by consumers who purchase their own home, is less than the marginal social benefit, which is the additional benefit to society from the consumption of an additional housing unit. This results in welfare loss (Welfare loss is the cost to society created by market inefficiencies), as there is a reduction in social benefits due to the misallocation of resources (Chart 1). The low levels of supply can be partially attributed to government failure. 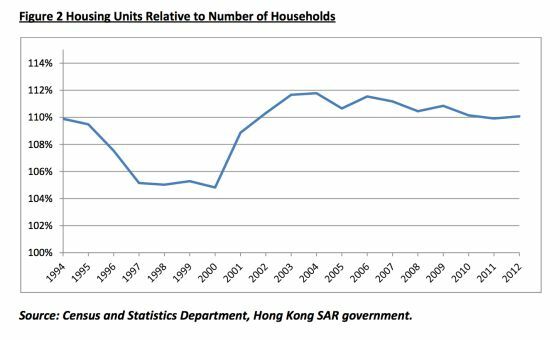 Although HK is largely a market-based economy (A market based economy is organized so that prices and production are based on supply and demand), the government is involved in the housing market (Lam, P.L., 2014.). An example of this is the restrictive land use regulations placed by the Government (Cox, W. & Pavletich, 2015, p. 12). 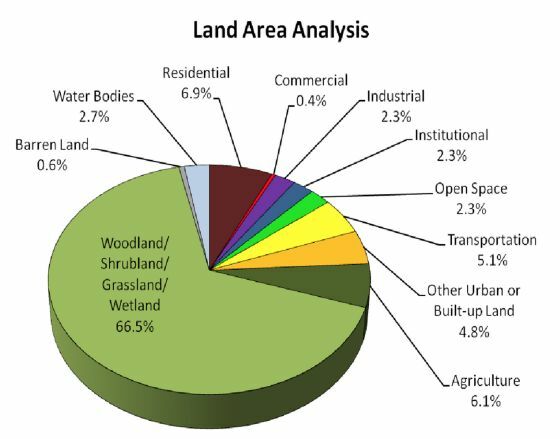 There is a large amount of spare capacity available for development, as over 60% of HK land is not utilized and is classified as “woodlands, shrub lands, wetlands, and marshlands”, whereas only 6.9% of land is used as residential areas (figure 2). However, the Government favours environmental sustainability and is therefore unwilling to develop this land (Lam, C., 2011, Planning Department, 2014.). The opportunity cost (opportunity cost is the next best alternative forgone) of preserving marshlands has resulted in the under allocation of land resources towards the development of housing, leading to allocative inefficiencies (Allocative inefficiencies occur when resources are not allocated in the combination and quantity most desired by society as a whole). Another instance of government failure may be its outdated policies that partially contribute to rising home prices. Currently, 6.1% of land is classified as “agriculture land” and is set-aside for native people as a part of the New Territories Small House Policy (For more information about agricultural land, native people and the small house policy, please see appendix I)(Leung, C. & Tang, E., 2014, Planning Department, 2014.). This can be seen as an inefficient use of resources, as these rights have been abused and monetized by villagers (Chan, O., 2014, Designing Hong Kong, 2014, Wai, F, 2015 & Cheung, P., 2015.). In addition, although the four largest developers in HK have purchased over 101.2 million square feet of agricultural land, they are reluctant to convert the undeveloped plots into residential areas, because to alter the purpose of land, they must pay a land premium (A land premium is a fee paid to the government in order to alter the purpose of the land) to the government (Leung, C. & Tang, E., 2014. & Brownlee, I, 2015.). 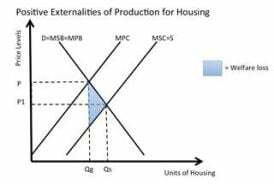 The effects of these policies can be analyzed using a diagram showing positive externalities of production for housing (Chart 2). Because of the low supply and restrictions on land use, the marginal private cost, which is the cost of producing one additional unit of housing to producers, is greater than the marginal social cost, which is the cost of producing one additional unit of housing to society. This results in welfare loss, as a lower quantity of housing is produced at a higher price. Private housing is underprovided and unaffordable partially due to over speculation (Speculation is when investors have a high demand for a good based on its expected future price) of investors in the property market. In the interview, Ms Wai attributed the high prices to the high levels of demand from HK and Mainland Chinese investors (Wai, F. 2015). This leads to constraints in supply for those who wish to buy a home to live in. 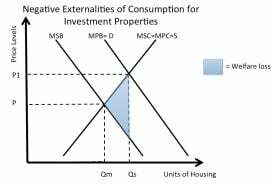 Over speculation has lead to negative externalities of consumption for private housing. Although there are currently enough units for each household (figure 3), the distribution of housing units is heavily unequal, and in 2011 only 36.50% of households own private housing (Yan, L., 2013.). This suggests that a significant portion of housing is being held by a relatively small amount of households for investment purposes. In many cases “sandwich class” HK citizens who cannot afford private housing but are unqualified or on the waiting list for public rental housing are forced to turn to cheaper sub-divided flats or cage homes (Enoch, N., 2013). This is a potential safety and health hazard (For a more detailed explanation of the dangers of subdivided flats, please see appendix II) (Hui, P., 2011, Zhao, S, 2014). Overcrowding may occur as young people and married couples may not be able to afford their own house and have to share housing with other generations of the family (Brownlee, I, 2015.). The retired elderly may have a lack of financial stability in the future as rental prices continue to rise (National Council On Aging, 2012.). Thus, the overconsumption of property for investment purposes contributes to lower living standards and health problems for society. The real estate market in HK to some extent can be seen as an oligopoly (An oligopoly has several large firms with a dominating market share) (Cheung, P., 2015 & Hong Kong Real Estate Investor, 2014.). Firstly, the government owns all land and leases it at auctions to property developers at a high price (Community Information Legal Centre & The University of HK, n.d.). This is a significant source of Government revenue (Research Office & Legislative Council Secretariat, 2013, p. 12.). In addition, in the interview with Mr. Cheung, he claims that property developers are price makers and can restrict land and housing supply (Cheung, P., 2015). High real housing prices have been shown to have a positive correlation with stock prices of developers (Leung, C. & Tang, E., 2014. ), and because the aim of developers is to maximize shareholder wealth, they have no incentive to greatly increase supply and hence allocate more weight to larger, luxurious housing units, instead of smaller flats, which are in higher demand (For more information about the allocation and demand for housing units, please see appendix III). There is therefore conflict between the private costs and the externalities associated with developing new housing, resulting in allocative inefficiency (Allocative inefficiency occurs when the economy fails to allocate resources in a combination and quantity most preferred by consumers). Although real estate developers receive a greater private benefit from maximizing profit through selling more large flats at a small supply, society would benefit more from an increase in supply of affordable private housing, leading to welfare loss. The welfare loss caused may increase the difficulty of calculating the socially optimal level of housing. In the interviews with Ms. Wai and Mr. Cheung, both parties have cited the high demand of housing and the insufficient supply as the primary cause behind the unaffordability of private housing (Cheung, P., 2015 & Wai, F., 2015). The shortage of housing leads to high prices and a loss in consumer surplus (Consumer surplus is the difference between the highest price consumers are willing to pay for the good and the actual price they pay for the good). Ms. Wai also identified other factors of production, particularly material and labour cost, to be a contributor to high housing prices (Wai, F. 2015). Due to “the reluctance of young people to join the (construction) industry”, there is a shortage of construction workers in HK, and their wages have been pushed up as a result (Sito, P., 2014, Siu, P., 2014.). As a result, the cost of producing housing has further increased and is passed on to consumers due to the highly price inelastic (Consumer demand for the good is unresponsive to a change in price) demand for housing, making housing less affordable. Although the government may have decreased the rate of growth in prices, housing prices has continued to rise (Global Property Guide, 2014). This suggests that the measures the government is currently taking are not enough to improve housing affordability. Therefore, the government should look into undertaking additional policies and evaluate whether they would be applicable to HK. To assess the public view of the housing market and consider what policies should be used in the future, a survey of HK residents was conducted. The survey was given to residents 25 and under, as well as residents 35 and over. A total of 145 citizens were surveyed. It investigates what people think the government is currently doing about the housing problem, how successful they believe these policies are, and which other policies they believe would be effective at reducing housing unaffordability in HK. The survey also attempted to find out whether the HK population believes that the lack of affordable housing is a significant problem. The separation of age groups in the survey was chosen to see if there is divergence of opinions between the older and younger generation concerning this issue. (1) A significant portion of people who owned their primary residence also owns a second piece of property. (2) Those who did not own property were unlikely to purchase property in the near future. Both groups were then asked about whether or not they were aware of different housing policies that are currently in use in HK. Both groups seemed to have a reasonable knowledge of the government policies that are being used. The older generation was generally more aware of housing policies used in HK. However, other than the tax on sale and transaction of property (stamp duty), over one in every four people were either unaware or unsure whether the individual policy is being used in HK.. Both groups were then asked to rate the effectiveness of policies currently in use by the HK Government. Building Government subsidized housing was rated as the most effective policy in use, whereas decreasing the size of country parks and importing foreign workers for construction sector jobs were rated as the least effective policies in use. Exempting first home buyers from stamp duty (had particularly strong support from younger HK residents). The following section covers what policies those interviewed believe are effective. A large proportion of people who are primary property owners also have investment property. The people who do not own property are pessimistic of their ability to enter the property market in the near future. This suggests that the property market is difficult to enter, which supports the secondary research found that the distribution of housing is uneven. Both survey and interviews supported the government trying to reduce the problem by increasing the supply of lower cost housing. This was evidenced by the broad support by all for increasing land sales, building more subsidized housing for low income earners and developing new towns as a way of increasing the supply of low cost housing. Other measures suggested to increase the supply of housing also gained some support from the primary research, such as exempting first time homeowners from stamp duty. The policies aimed at reducing demand gained greater levels of support from the survey respondents as compared to the expert interviews. There was strong support for a capital gains tax on investment properties from those surveyed, however Ms. Wai believed that it would be ineffective. Those interviewed were supportive of the government policy to import construction workers but this policy had limited support from those surveyed. The survey was strongly supportive of Government guaranteed loans for first homebuyers but those interviewed seemed to think that the problem was due to a shortage in supply, so the measure may simply increase prices and not address the problem. There also appeared to be disagreement among those surveyed and interviewed about whether or not the stamp duty effectively deals with this issue. In order to analyse the policies suggested, the data has been complied into a table and each policy represented is given a number. 3. Reduce the land premium in order to sell land to developers at a lower price (Brownlee, I, 2015.). 4. Relax plot ratio and building height restrictions (Warren, D. & Transport and Housing Department, 2013.). 9. Subsidize low income households and first time homebuyers (Brownlee, I, 2015.). The majority of policy recommendations were extensions of current policies that are already being used to increase housing affordability in Hong Kong (P.16). This includes increasing taxation on foreign property buyers, increasing lower cost land sales to developers, increasing conversion of agricultural land to residential areas, and relaxing the plot ratio of buildings. Overall, there was greater consensus for policies that were aimed at increasing supply, whereas there was more divided opinions regarding the effectiveness of policies influencing demand. There were no major criticisms of the policies currently in use by the government, other than that the government should implement these policies on a greater scale. However, the effectiveness of the stamp duty policy remains somewhat controversial among the research published. Policies that were recommended by both Government sources and professionals from the housing industry include (4), (5) and (10). Policies that were recommended by professionals but were opposed by the government include (1) and (10). The difference in opinions regarding (1) appears to be due to the political unpopularity of removing the small house policy among indigenous villagers. The government may be unwilling to carry out policy (3) and (11) on a greater scale due to budgetary reasons. The research supported the government carrying out policies recommendation (6), (7) and (8), as they have been successful in increasing housing affordability in similar cities and may be applicable to HK. Based on the primary and secondary research conducted in investigating the question “What can the Government do to improve Private Housing Affordability for Hong Kong Citizens?”, the following conclusions and recommendations have been arrived at. The premise of the question was well proven. Private housing affordability in HK is one of the worst of any major city globally. As shown by the research, private housing in HK is significantly more unaffordable than any of the other major cities illustrated. This suggests that the free market quantity of private housing is lower than the socially optimum level, resulting in welfare loss. Both the primary and secondary research strongly supported that private home affordability in HK is a significant issue. The research also strongly supported the view that the lack of housing affordability was an example of market failure. Both the primary and secondary evidence showed a variety of different market failures relating to this issue. The interview findings and secondary research supported the view that the ownership of private housing is a merit good that can be associated with financial security and personal happiness. Private housing affordability is also shown to have positive externalities such as economic growth and a more harmonious society. The research also supported that the under provision of private housing has to some extent led to negative externalities such as a more unequal income distribution and social discontent (especially among the young). This illustrates the need for the Government to increase private housing consumption to bring about welfare gain in HK. Restrictive land regulations by the government may be a source of government failure, as it results in less housing being built. In relation to the specific issue of Occupy Central, while the older generation and the secondary research was sympathetic of the view that unaffordable housing contributed to public discontent with the government, a great proportion of the younger generation surveyed did not feel this was as a significant factor. This was interesting as the protests were largely driven by the younger generation. In relation to the question about what the government can do to reduce the problem there was broad agreement in some areas and disagreement in others. The policies that had broad agreement were outlined in the data analysis of the primary and secondary research. Both generations surveyed generally agree about what should be done. The policies with the broadest public support were mainly aimed at increasing supply, for example, that the government should provide more low cost housing for those financially disadvantaged and make more land available for construction of low cost housing. These policies are largely supported by the experts interviewed and the secondary research. However, the policy options aimed at reducing demand overall had less agreement. The public survey was much more supportive of these policy initiatives than some of the experts interviewed. There were some differences in what the experts thought should be done compared to what the people surveyed thought. There was a feeling among those interviewed that measures, such as stamp duty or a capital gains tax, may instead drive up prices rather than increase the supply of affordable housing. There were also some differences between what government sources believe is effective compared to what professionals from the private sector believe is effective. In addition, there were conflicts in opinion among professionals in some areas. There did not seem to be a single measure that people thought would solve the problem, therefore any solutions are likely to need to be a combination of different policy measures. Based on the research, the following recommendations are offered. (1) The government should for the most part continue with the actions that they are currently taking to reduce this problem. (2) The government should make greater efforts to publicise and explain their policies (i.e. the importation of construction workers, the current rates of stamp duty) as some these policies does not have strong support. (3) The government should expand the building of low cost housing for economically disadvantaged residents. This could be achieved by developing new towns outside the city area. (4) The government should consider restricting the amount and type of home ownership allowable for non-permanent HK residents. The problem of lack of affordable housing and the associated market failure problems that arise will not be easy to solve. Even if all of the above recommendations are adopted, the problem is unlikely to disappear completely. The fundamental issue is that supply is growing more slowly than demand for low cost housing. This is a market-based problem that the government can influence but may not be able to solve completely. There was no way to know, given the scope of this paper, to what extent the problem would be reduced, even if the government were to follow some or all of the above recommendations. The theory suggests that there is a socially optimal quantity of private housing in HK and if this is not achieved there will be a welfare cost to HK. However it is not actually possible to know what this quantity is, and it is difficult to quantify how much quantity demanded and supplied has to be altered in order to achieve a socially optimal level. The research has made no attempt to determine the cost of the above recommendations. While building more government subsided housing is a popular policy, it is also expensive to implement on a larger scale. No consideration has been given to possible opportunity cost of the government following some or all of the above recommendations. Building more housing may require higher tax rates, which HK citizens may be reluctant to pay. The negative externalities that arise from the construction of new housing have also not been taken into consideration. The survey was conducted using an online platform and does not reflect a scientific or systematic approach to finding targeted individuals, therefore it may contain bias and may not be reflective of the HK population in general or the specific age groups surveyed. Social media was to some degree used in order to encourage a larger survey response. In addition, the interview results could have been more comprehensive if more of the experts were willing to give their opinion about this issue. The ideological bias of the interviewees might also be limiting the validity of the conclusions drawn. The depth of research was further limited by time constraints and the need to meet deadlines for drafts and final version of the essay. Brennan, M., 2011. The Impacts of Affordable Housing on Education: A Research Summary. Centre for Housing Policy. Available from: http://www.nhc.org/media/files/Insights_HousingAndEducationBrief.pdf [Accessed May 9, 2015]. Brownlee, I, 2015. “Affordability Myth”, South China Morning Post 17 March, C5. Buildings Department, 2015. Subdivision of a Flat (subdivided units). Buildings Department. Available from: http://www.bd.gov.hk/english/services/index_faqJ.html [Accessed June 11, 2015]. Bush, R.C., 2014. The Roots of Hong Kong Protest. The Brookings Institution. 30 September 2014. Brookings: Blog. Available from: http://www.brookings.edu/blogs/up-front/posts/2014/09/30-roots-of-hong-kong-protest-bush [Accessed May 6, 2015]. Chan, O., 2014. Small houses take the baton. Focus Hong Kong. Available from: http://epaper.chinadailyasia.com/focus-hk/article-2626.html [Accessed May 25, 2015]. Cohen, R. & Wardrip, K., 2011. The Economic and Fiscal Benefits of Affordable Housing. Planning Commissioners Journal [Online], (83), p. 2. Available from: http://plannersweb.com/wp-content/uploads/2012/07/501.pdf [Accessed April 29, 2015]. Cox, W. & Pavletich , H., 2015. 11th Annual Demographia International Housing Affordability Survey: 2015. 11th Annual Demographia International Housing Affordability Survey: 2015 [Online], pp. 12-13. Available from: http://www.demographia.com/dhi.pdf [Accessed February 1, 2015]. Designing Hong Kong, 2014. The Small House Policy. Available from: http://www.designinghongkong.com/v3/wp-content/uploads/2014/03/shp.pdf [Accessed February 15, 2015]. Enoch, N., 2013. “Where home is a metal cage: How tens of thousands of Hong Kong's poorest are forced to live in 6ft by 2ft rabbit hutches”, Mail Online, 7 February. Available from: http://www.dailymail.co.uk/news/article-2275206/hong-kongs-metal-cage-homes-how-tens-thousands-live-6ft-2ft-rabbit-hutches.html [Accessed March 15, 2015]. Global Property Guide, 2014. Perfect Storm Brewing for Hong Kong property market. Available from: http://www.globalpropertyguide.com/Asia/hong-kong/Price-History [Accessed 3 June, 2015]. Hase, P.H., 2008. The Six-Day War of 1899: Hong Kong in the Age of Imperialism. Hong Kong: Hong Kong University Press, pp. 15-16. Hong Kong Real Estate Investor, 2014. Hong Kong Real Estate Investor- Developers. Available from: http://www.hkrei.com/hong-kong-property-developers/ [Accessed April 29, 2015]. Hui, E. & Tse, D. (n.d.). Overview of RICS Housing Research: Report on Housing Affordability in various Asian Cities and on the Forecast of Housing Needs in Hong Kong in the next 5, 10, and 20 Years. Available from: http://www.ricsasia.org/downloadfile.php?id=1047. [Accessed May 23, 2015]. Information Services Department, Census and Statistics Department, 2014. Hong Kong: The Facts, Hong Kong: Information Services Department. Lam, C., 2011. LCQ4: Fire safety problem of sub-divided units, Hong Kong Legislative Council. Available from: <http://www.info.gov.hk/gia/general/201107/13/P201107130222.htm>. [Accessed: May, 27, 2015] Lam, P. L., 2014. ‘Government must back off to keep Hong Kong a truly free market’, South China Morning Post 4 February. Available from: <http://www.scmp.com/comment/insight-opinion/article/1420519/government-must-back-keep-hong-kong-truly-free-market>. [Accessed June 1, 2015]. Lee, B.E., 2014. High house prices are a bigger problem than a lack of democracy. South China Morning Post. 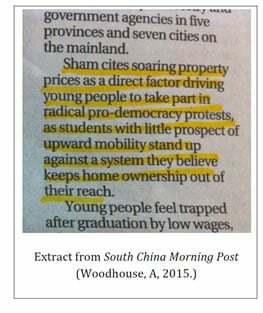 Available from: http://www.scmp.com/print/comment/letters/article/1614571/high-house-prices-are-bigger-problem-lack-democracy [Accessed February 1, 2015]. Legislative Council, 2013. Measures to address the overheated property market. Hong Kong Legislative Council. Available from: http://www.info.gov.hk/gia/general/201307/03/P201307030431.htm [Accessed May 13, 2015]. Legislative Council Secretariat & Research Office, 2011. Information Note: Housing Supply in Hong Kong, pp. 5–7. Available from: http://www.legco.gov.hk/yr12-13/english/sec/library/1213in20-e.pdf [Accessed May 4, 2015]. Leung, C. & Tang, E., 2014. Availability, Affordability and Volatility: the case of Hong Kong Housing Market. Munich Personal RePEc Archive [Online]. Available from: <http://mpra.ub.uni-muenchen.de/58770/1/mpra_paper_58770.pdf>/ [Accessed February 26, 2015]. Lo, A., 2012. “No Place for Subdivided Flats in Our City”, South China Morning Post. Available from: http://www.scmp.com/comment/insight-opinion/article/1014224/no-place-subdivided-flats-our-city [Accessed June 13, 2015] Lo, A., 2014. “Take on Vested Interests over Housing”, South China Morning Post 18 December, C3. McNab, K. 2011. Basic Law protects village-house rights of New Territories' indigenous residents. South China Morning Post 26 November. Available at: http://www.scmp.com/article/985945/basic-law-protects-village-house-rights-new-territories-indigenous-residents [Accessed June 11, 2015]Musgrave, R.A., 1959. The Theory of Public Finance: A Study in Public Economy. New York: McGraw-Hill, pp. 13–14. National Council On Aging, 2012. Economic Security for Seniors: Fact Sheet. Economic Security For Seniors: Fact Sheet. Available from: http://www.ncoa.org/press-room/fact-sheets/economic-security-for.html [Accessed May 23, 2015]. Numbeo, 2015. Property Prices Index Rate. Current Property Prices Index By City. Available from: http://www.numbeo.com/property-investment/rankings_current.jsp [Accessed May 9, 2015]. Ngo, J, 2015. A place to live is a poor child's biggest worry. South China Morning Post 1 January, C5. Paavola, J., 2008. Merit Goods. Encyclopedia.com. Available from: http://www.encyclopedia.com/doc/1g2-3045301524.html [Accessed February 25, 2015]. Pau, J., 2014. “Generation hope-less” South China Morning Post, 21 October. Available from: http://www.scmp.com/comment/insight-opinion/article/1621365/lack-opportunities-hong-kong-creating-generation-without?page=all [Accessed May 6, 2015]. Pettinger , T., 2011. Market Failure in the Housing Market. Economics Help. Available from: http://www.economicshelp.org/blog/338/economics/market-failure-in-the-housing-market/ [Accessed February 23, 2015]. Planning Department, 2014. Land Utilisation in Hong Kong 2013. Hong Kong Planning Department, Government of Hong Kong Special Administrative Region. Available from: http://www.pland.gov.hk/pland_en/info_serv/statistic/landu.html [Accessed April 25, 2015]. Research Office & Legislative Council Secretariat, 2013. Fact Sheet: Major sources of Government Revenue, p 2. Hong Kong Legislative Council. Available from: http://www.legco.gov.hk/yr12-13/english/sec/library/1213fs19_20130807-e.pdf [Accessed May 8, 2015]. Research Office & Legislative Council Secretariat, 2013. Information Note: Land Supply in Hong Kong. Available from: http://www.legco.gov.hk/yr12-13/english/sec/library/1213in21-e.pdf [Accessed June 6, 2015]. Sito, P., 2014. Skilled workers in short supply in Hong Kong's construction industry. South China Morning Post. Available from: http://www.scmp.com/property/hong-kong-china/article/1451437/skilled-workers-short-supply-construction-industry [Accessed April 26, 2015]. Siu, P, 2014. City needs 10,000 more labourers. South China Morning Post 27 May. Wardrip, K., Williams, L. & Hague, S., 2011. The Role of Affordable Housing in Creating Jobs and Stimulating Local Economic Development: A Review of the Literature. Centre for Housing Policy, p. 1. Available from: http://www.nhc.org/media/files/Housing-and-Economic-Development-Report-2011.pdf [Accessed April 29, 2015]. Warren, D. & Transport and Housing Department, 2013. Public Forum on Housing and Land in Hong Kong: Policies, Issues and Debates. Public Forum On Housing And Land In Hong Kong: Policies, Issues And Debates. Available from: http://fac.arch.hku.hk/ahrn/wp-content/uploads/2012/12/hkip-housing-land-supply-23-2-2013.pdf [Accessed May 20, 2015].